Who would have thought there’d be enough action in the small sedan segment of the market to warrant yet another comparison test – our fifth such test since the beginning of 2016? Yet here we are, in a world where the small car is increasingly being seen as a great alternative to the mid-size sedan because, essentially, these new ‘small’ sedans offer better space for your spend than vehicles in the next segment up. Take these three options, for instance: here we have the Japanese-made Mazda 3, the new ‘trying to be Euro’ Korean-made Holden Astra, and the actually Euro-suave Turkey-built Renault Megane – a couple of which are pushing the boundaries of dimensions for what is considered a small car. But the advantage of them being marginally smaller than mid-sized models is all there for the buyer. They can be packed with more equipment, and priced more attractively. And that’s exactly why we’ve chosen these three highly specified variants: the Holden Astra LTZ, Mazda 3 SP25 GT, and Renault Megane Intens. Visually – not that it’s part of our assessment criteria – myself and my co-tester Trent Nikolic (and even our punk snapper Sam Venn) think the new Megane sedan looks more premium and expensive than its competitors, with the Mazda coming in second and the new Cruze, sorry, Astra sedan appearing to be a little less inspiring. That’s just three unattractive blokes’ opinions on appearance, so you can take it as you like – but the question is whether there is more to the Astra? Are so many buyers getting it right by choosing the Mazda 3? And will the Megane live up to the look? Read on to find out how they stack up against one another. We’ve tried to keep these three close on price, but that’s hard – the flagship Astra LTZ is pretty bloody affordable, considering what you get for the money. At $29,790 plus on-road costs it undercuts both the Mazda 3 SP25 GT and Renault Megane Intens by $2200 – both of those vehicles have list prices of $31,990 plus on-road costs. For context, the Astra we have here is the top variant in a range of four models, while the Mazda 3 SP25 GT is the fifth peg up a six-peg tree, and the Megane Intens sedan is the top variant of two models in its range. Given their prices and positions in their respective ranges, each has a load of standard equipment. All three have touchscreen media systems with integrated satellite navigation, though only the Holden has the latest smartphone connectivity in the form of Apple CarPlay and Android Auto. Oddly for a European car the Renault misses out on digital radio – the others have DAB+. The Mazda has a nine-speaker Bose stereo system, bettering the eight speakers of the Renault and the Holden’s six. The Mazda is the only car on test with a head-up display, though all three have digital speed readouts. All three have push-button start and keyless entry, and the Mazda has electric driver’s seat adjustment. The Mazda 3 has a rear-view camera and rear parking sensors, which is well short of the other two competitors – both the Astra and Megane add front parking sensors, and both of them have semi-automated parking systems included. The Mazda doesn’t have a sunroof – you’ve got to shop up to the Astina version to get that – where the other two have electric sliding glass sections in their turrets. Each rides on 18-inch alloy wheels (the Mazda with slightly narrower 7.0-inch rims, where its rivals have 7.5-inch wide wheels), and the tyre specs are close, too: Mazda – 215/45; Holden 225/40; Renault 225/40. The Mazda and Holden have mini rear spoilers on their boot lips as well. The Astra is the only one of these three with halogen headlights, but likewise it and the Megane have auto high-beam lights, but the Holden’s competitors have LED headlights, the Mazda’s with cornering functionality, and each has auto on/off headlights. All have auto wipers, and all have heated side mirrors, though the Astra misses out on auto-folding. As for safety, the Mazda and Holden both have the maximum five-star ANCAP crash test rating, while the Renault sedan is yet to be tested. All three sedans have six airbags fitted as standard (dual front, front side, full-length curtain), and their electronic safety kit bags are pretty full as well. The Astra has blind-spot monitoring and the naffly named ‘Holden Eye’ forward-facing camera system encompassing lane-keep assist, forward distance indicator and forward collision warning – but it misses out on autonomous emergency braking. The 3 and Megane both have all the same tech, and both have autonomous emergency braking as well – the Renault’s system includes adaptive cruise control, and the Mazda’s system can even jam on the brakes in reverse if it thinks a collision is imminent, plus the Mazda is also the only car here with rear cross-traffic alert. So depending on your priorities, there’s plenty of stuff in each of these cars. But what about space? Okay, so it’s not that close, but these aren’t what I’d call ‘small’ cars, either. I mean, the difference for boot volume between the big-selling Camry and the Megane is just 2.3 per cent. It’s also the only one here with a full-size temporary spare wheel – the others have space-saver spares. The seat-fold mechanisms of all three cars are simple enough, but the Mazda has the best load-through usability due to a relatively flat section between the boot and the cabin. 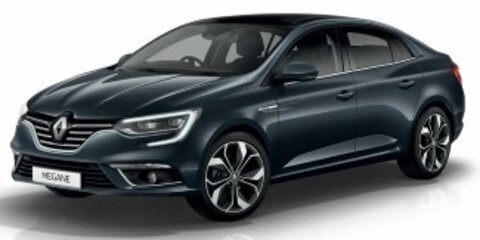 The Renault’s is stepped, meaning snags may be possible, and the Holden’s is the worst of these three with a big cliff at the back of the seats. The Astra was also the worst for load-through size, and it had the worst hinge mechanism of the three vehicles here – all have goose-necks, but the Megane’s are hidden away, the 3’s are smaller than the Astra’s, and our Holden tester had sections on the hinge where you could see the undercoat. That’s a bit of a theme, here – attention to detail isn’t as good in the Astra’s cabin as its competitors. In practice, the interior space is definitely not as capacious as a Camry, but nor is it too squishy in any of the vehicles for four adults to sit in relative comfort for a few hours. The Mazda does feel the smallest of the three, as its dimensions suggest, with the least legroom on offer. With the driver’s seat in my six-foot-tall setting, my knees were hard up against the back rest in the Mazda, where they were merely lightly brushing the seatback in the Renault, and there was impressive clearance (three fingers’ worth!) between knee and fabric in the Astra. The transmission tunnel intrusion is the greatest in the Mazda as well. The Astra fell short on headroom – it was the worst in that regard, followed by the Megane and then the 3 – but made up for it with the most width across the back seat, while the Renault had the least toe-room. The Megane is the only car here with rear-seat air vents, and it, along with the Holden, have 12-volt charge points in the back, where the Mazda has nothing. All three have dual ISOFIX child-seat anchors and three top-tether attachment hooks. As for overall back-seat comfort, all testers agreed the Holden was almost church pew-like – that is to say, not very pleasant despite its additional width – where the Mazda, although tight, was well cushioned, and the Renault was equally good. Up front, the Mazda is the only one with electric seat adjustment for the driver, and the Renault misses out on seat heating the other two have. That’s space sorted – but what about the space, as in, the cabin areas of each of these small sedans? As we said at the beginning, the Renault looks the most stylish outside, and its interior is certainly distinct and characterful compared to the other vehicles here due primarily to its portrait-oriented 8.7-inch media screen. That system takes some time to get used to, with the lack of a hard-button to go to the home screen the main issue. The graphics are all pretty smart, and we liked the transition screens, but the load times can be a little slow, and the edge buttons (they don’t push in, rather they are touch-sensitive) show up oily fingerprints within seconds of being cleaned. The Renault’s screen layout with its rear-view camera display on top and parking sensor illustration below makes it a bit hard to actually see what’s on the top display, too. It has active and static steering guidelines, though, which makes it easy to position in parking spaces. That said, phone connectivity is well sorted, with easy Bluetooth connectivity and a pair of USB ports up front, along with another two in the glovebox. We reckon the digital instrument cluster is a really nice touch, one that furthers the flair of the cabin and makes it easy to see your speed readout – no matter which of the drive modes (eco, neutral, personal, sport and comfort, which, as Trent put it, is “a lot for a car that doesn’t actually need any”) is selected. Triggering different modes also changes the ambient lighting, with strips on the doors and console enhancing the special feel of the cabin – it’s not unlike what you find in a Mercedes-Benz small car – which is brought gently back down to earth by the hard shiny plastics nearby. The mesh cover on the sunroof mightn’t be ideal on a really hot summer’s day, either. We reckon the Renault’s glovebox could be the most useless in the world (the closing mechanism on ours was a bit hit and miss, too), and we continue to be mind boggled by the insistence on having the cruise control switch between the seats. And yes, because French car the cupholders are a bit shallow, too. But the loose item storage is otherwise quite good – better, in fact, than the Mazda when it comes to door pocket storage. The Megane is easily the most upmarket of these vehicles inside – those hard plastics aside – with the soft finishes on the dash and doors and that coloured lighting really making this thing stand out. The Mazda’s cabin is easily the next most premium, at least in terms of perceived plushness, with its media screen a stand-out for clarity and ease of use. The Mazda’s system is perhaps the most intuitive here, with the MZD Connect rotary dial controller backing up the screen (which is touch-capacitive when the car isn’t in motion). We’ve had issues with Mazdas in the past, though, in terms of Bluetooth audio glitches. The Mazda also has dual USB points, one for media and one for charging, plus the head-up display of the Mazda is a thoughtful – if slightly tacky – item. It’d be so much more upmarket if the projection was on to the windscreen rather than a flip-up plastic screen. The Mazda has deep central cupholders but misses out on some of the loose-item storage of its competitors (like bottle-holders only in the back doors rather than proper pockets, and only one map pocket in the back), but the cabin feels premium – the screen, controls, materials and finishes all combine nicely. The plastics of the Mazda are largely hard – there are some soft bits on the doors and dash – but they look expensive. The Holden’s plastics are hard but they look cheap. Things like the lack of covered centre bin between the front seats just makes it look less special, even though it has the largest door pockets of this trio. There’s a small soft finish on the dash, but it’s not convincing enough in this company, and the weird rubberised finish on the handbrake is far less premium than even a fake leather finish would be. A plus for the Holden is that it’s the only model here with Apple CarPlay and Android Auto connectivity, which could matter enough to you that you’d choose it. The system is simple to use but falls short in terms of the graphics and displays – it all just looks less impressive than the competition, here – but at the very least the rear-view camera with active guidelines is broad and clear. Further pulling the Holden down is the fact it has only has one USB port – below average in this company – and the other cars here have dual-zone climate control where it only has single-zone. It also lacks seatbelt height adjustment. While the Megane has those French controls that take some acclimatisation, the Astra’s steering wheel buttons are truly confusing. The volume button is at the back on the right-hand side, and the buttons on the front are quite vague as to what they’re for (we soon learnt that they control the driver info screen and media system). The Holden misses out on items like the auto-dimming rear-view mirror, and its electric windows are all auto-down, but only the driver’s is auto-up. The Renault has auto up/down all around, where the Mazda skimps out most with only auto up/down for the driver’s door. And while the Holden has a sunroof with a solid cover to keep out the harsh Aussie sun, the operation of that screen is hard to modulate – it is magnetised and that makes it hard to shift it smoothly. So it goes Renault, then Mazda close behind… and then there’s a pretty sizeable gap to the Holden, which doesn’t feel nearly as special inside. In fact, it’s not very special inside, and that’s perhaps one of its biggest issues. There are three different takes on front-wheel-drive propulsion here, two of which are turbocharged, and the remaining one is the Mazda. The 3 SP25 GT has, as you may have guessed, a 2.5-litre four-cylinder engine under its bonnet. Seems big for the size of the car, right? Well, it certainly is, especially when you consider the Holden has a 1.4-litre engine, and the Renault has a (double) pint-sized 1.2-litre. As very European as the Renault’s engine is, its tiny mill is underdone, at least on paper, in this company, with 97kW of power (at 5500rpm) and 205Nm of torque (at 2000rpm). It has what Renault terms an EDC – efficient dual-clutch – automatic transmission. With just 200cc of extra capacity, there’s a big jump to the Holden’s outputs – 110kW (at 6500rpm) and 240Nm (from 2000-4000rpm). It runs a conventional six-speed automatic. And, if you think bigger is better, you’ll love the fact the Mazda has a chunky advantage over its small-engine rivals: there’s 138kW (at 5700rpm) and 250Nm (at 3250rpm). As with the Holden, it has a six-speed auto. But how that translates to the real world is definitely more interesting than the disparity suggested by the numbers. It’s not like there’s much of a power-to-weight differential here, either – all three cars are within six kilograms of each other based on their kerb weights: Astra – 1318kg; Megane – 1321kg; 3 – 1324kg. In urban driving we had some issues with the dual-clutch transmission and turbo engine of the Megane. In fact, it was pretty putrid at times. For instance, we pulled up at a Give Way sign. The engine’s stop-start system engaged. We waited for traffic to pass, then applied some throttle. The jerking motion that resulted was like being pushed in the back by someone you hadn’t seen, and the gearbox stumbled to keep up with what was happening. It revved out to 4500rpm in first gear and then quickly upshifted through second and third, making for a far-from-progressive experience. This was almost entirely cancelled out with stop-start disengaged, but the traffic light take-off was still slightly manic in its behaviour, particularly if you happened to be in a hurry. Once you were away from the mark it offered the snappiest and liveliest response of these three, and with more relaxed throttle application it was measurable and manageable. Whether you’ll have the patience necessary to deal with its stop sign temperament will determine your take on it. All those concerns abated at higher speeds – the engine and gearbox settled into a groove that was unflustered, with the seven-speed dual-clutch dropping back a gear or two cleverly on steep hill climbs to enable the car to maintain its pace. Indeed, it never felt underdone in this company for grunt. The Holden was considerably better behaved at low speeds. Its seven-speed automatic gearbox displayed none of the stumbling from a standstill – in fact, it was perfectly suited to urban driving, with linear power delivery across the rev range. There was little turbo lag to speak of, and while it was a little boomy higher in the rev range, it was relaxed and liveable in the urban area. At higher speeds, too, the Holden was well resolved in the way it managed itself. The engine is quiet and offers good refinement, and the auto transmission handled hills and undulating speeds very well. The 3’s engine, by comparison, took more pushing, mainly because its transmission is geared towards saving fuel at the expense of outright performance. Yep, it has the highest power and torque outputs and the largest engine capacity, but it felt by far the most sluggish of these three. That is, until you flicked the Sport mode switch near the shifter, which made the transmission hang on to gears a little longer and the engine to rev out to its sweet spot as a result. The issue here, though, is that the engine is really noisy, and we suspect the fuel use would pay the price a bit if you left it in Sport mode. At low speeds the drivetrain of the Mazda 3 – when not in Sport mode – was verging on annoying. It constantly aims for the highest gear, and that means it hunts more for the right gear when you’re dealing with hills and speed humps. Another intriguing thing is there’s bugger-all in it for claimed fuel use. The claim for the Mazda and is 6.0 litres per 100 kilometres, where the Holden and Renault are both pegged at 6.1L/100km. In our testing it seemed clear the behaviour of the Mazda’s tentative gearbox meant we had to wring its neck more than the others, with a readout of 9.0L/100km registered. The next best was the small-turbo-engine of the Megane, which saw a readout of 8.6L/100km, where the slightly larger-capacity engine of the Astra helped it manage a more relaxed consumption of 7.5L/100km on test – and that’s in spite of the fact the Astra is the only one without engine stop-start. It seems, then, the Astra’s drivetrain was the most rounded of these three. If we had to live with one of the others in mainly urban driving, it’d probably have to be the Mazda, as it didn’t stumble as much in stop-start situations. For open road driving the Renault would be our second choice. Three different takes are again present when it comes to the road manners on offer. The Renault is typically French in its soft suspension and inaccurate steering; the Holden bears its Aussie steering and suspension tune with pride; and the Mazda follows the brand’s trademark ‘Zoom Zoom’ mantra with a stiff chassis and more involved steering. What you prefer will ultimately determine which you like most – but we’d suggest where you live and what you plan to do with your car every day will almost certainly determine which is best for you. For instance, the Astra has by far the best balance of comfort and composure on rubbish country roads – to a level that it feels like a Commodore in shrunken clothes. It soaked up bumps better than its rivals, with the suspension settling quickly but never sharply. It dealt with open road highway driving without fuss, too. Road joins, potholes and more were essentially dismissed by the chassis. It was the flattest through a series of corners, too. Those chassis tuning engineers at Holden sure know what they’re up to. The opposite was the case for the Mazda, which felt twitchy on our rough B-road out the back of Picton. On the freeway, the Mazda was the most unsettled of the three. The sharpness of its suspension meant it felt twitchy, picking up inconsistencies in the road the others glided over. It was even crunchier on rough road surfaces. Its brake pedal response was the only one that we found hard to judge – initially it was quite spongy, before grabbing firmly. The other two had more linear brake response. We mentioned earlier that the Mazda’s engine was loud, and it was also the noisiest on coarse-chip surfaces for tyre roar, followed by the Renault. The quietest by some margin was the Holden. Striking the middle ground for high-speed comfort was the Renault. The softness of its springs and dampers meant it coasted over rolling bumps comfortably, but its wheels would fall into potholes and upset the balance of the car. Over our section of freeway driving, it was the Renault’s comfort-focused ride that stood out the most, even if it didn’t have the best engagement for the driver. The Megane creaked and groaned more with surface pitch changes, and the suspension thumped more on bumps. Its steering was the most aloof, with response that was at times hard to judge. The most pinpoint accurate was the Mazda, albeit with a little too much resistance at times, where the Holden struck a nice balance between weight and control. When it came to urban driving, the Renault’s supple suspension came to the fore once more. Over a smooth new section of pavement where the other two felt quite jittery, the Renault sailed admirably. Indeed, it was perplexing just how much firmer the Holden felt in the urban environment than it did out of the city confines. It wasn’t uncomfortable, per se, but the front end clunked into creases in the road surface where the other two offered more rounded progress. It didn’t entirely replicate a Commodore experience, then – and perhaps there’s a good reason that Holden is pitching the Astra sedan as an outer-suburbs/rural fringe car. It felt notably better there. That said, its self-parking system worked a treat on test, where the Renault’s system failed to pick up the parking spot we used as a test zone. It was parking behind a boat, for what it’s worth, so maybe the logic of the Holden’s system is just a bit better, despite the fact the Renault system has more functionality (reverse perpendicular, reverse parallel and parking space entry, where the Holden doesn’t have the latter). The Mazda doesn’t have a self-parking system, so we did it the old fashioned way, and we found its response to be very quick, a little unnervingly so, in fact. Where a usual arm-twirl would have been needed, just a half-turn of the tiller meant I’d almost found myself running aground on the edge of our parked boat. Still, that steering is easy enough to get used to with repetition, with meaty response that will certainly appeal to more enthusiastic drivers. Indeed, it’s the more driver-focused car of these three, and we assume those sorts of buyers will be able to forgive its sharp suspension which, around town, picks up lots of bumps in the surface. It recovers well after a large bump, though. The Renault is by far the standout offering in this company for longer-term ownership – well, at least from a customer care point of view. The Megane has a five-year/unlimited kilometre warranty with five years’ roadside assistance included. And it could prove a good option for distance commuters, with maintenance due every 12 months or 30,000km. The Mazda’s warranty is a three-year/unlimited kilometre program, with no roadside assist included with the purchase. The Japanese model needs its maintenance every 12 months or 10,000km, which could be annoying if you do a lot of miles. Holden backs its cars with a three-year/100,000km warranty plan, but the Astra comes with a five-year/130,000km plan. The company offers all new-car buyers a year of roadside assistance with their purchase. However, it has odd nine-month servicing intervals, albeit at 15,000km junctions. There you have it – three small sedans, each of which takes a very different tack to its rivals. The Holden is undeniably more affordable, and if dollars count to you, we can understand why you’d choose it over its competitors. I mean, a few grand is a few grand. But with that said, unless you’re only driving on country roads, it’s hard to pin down any other specific strengths of the Astra in this spec. The Mazda is similar. We’d suggest the SP25 – a more affordable option with a few less trinkets but still the same engine – would be a better bet for the majority of people. We thought so in our Mazda 3 range review, too. And unless you desperately want to have the most driver-focused car of this trio, it’d be hard for us to tell you to rush out and buy one. Then there’s the Renault, that imperfect blend of imperfections that was easily the most endearing car of this trio. The interior felt more special than its competitors, and while the drive experience was flawed, it was still quite comfortable. Personally, if I had to buy one of these three, this would be it – mainly because I drive about 160km per day on freeways, and it fit that user purpose the best. Plus I like its styling more than the others. However, to suggest it is our outright recommendation would be flawed, too. It’s not a terrific small car. But it is a nice one. So as our fifth test of small sedans since the beginning of 2016, we’ve been left a little underwhelmed. None of these are bad cars, but none reset the standard by which small sedans are measured. There are two models that stand out as stronger alternatives than anything we had here. The Honda Civic with its superb balance and comfort, and the Subaru Impreza with its excellent space and equipment. Each of those small sedans offer better all-round packages in our opinion – so, if after reading all this, none of these three cars do it for you, be sure to check out our other small sedan comparison tests.